Clonal Paradox rootstocks are micro-propagated in a lab and then potted in a soilless potting medium. Because they are clones, they have the same genetic constitution. Clonal rootstocks are sold as potted unbudded rootstock or as nursery field grown rootstock, grafted or budded trees. Planting an actively growing containerized ‘RX1’ rootstock. Photo: J. Hasey. 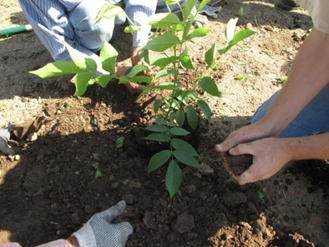 Potted walnuts are easy to plant but the grower becomes the nursery. Hydration/irrigation must be watched very carefully. If planted in late fall or the dormant season, trees are subject to dehydration that makes them more susceptible to winter freeze damage unless it rains or you can irrigate. If planting dormant trees, it’s often best to plant in late February or early March after hard freezes are less likely. When planted in late spring, careful attention to irrigation is critical. 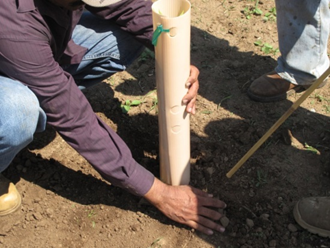 Placing a grow tube and bamboo stake over the rootstock. Photo: J. Hasey. 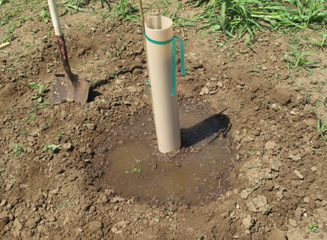 Irrigation: The first month after planting, the potting medium surrounding the roots cannot dry out until the roots have grown out into the soil. Once roots are out in the soil, keeping the potting medium hydrated is not quite as critical. Low volume drip systems work well or any irrigation system with directed water as long as it is applied with short, frequent irrigation intervals to keep the potting medium and the growing root system wet during the season. Watering clonal rootstock right after planting. Actively growing potted clones should be planted May 15 to June 1. Photo: J. Hasey. Budding or grafting: If irrigated properly, potted trees should grow well and attain adequate growth to fall bud trees in August. If not or for trees that don’t take the bud, they can be budded or grafted the following spring. Clonal Paradox rootstocks provide options in selecting a rootstock to manage site specific problems or issues in orchards. ‘RX1’ has moderate resistance to Phytophthora, ‘VX211’ has some tree tolerance to lesion nematode, and ‘RX1’ and ‘Vlach’ clonal rootstocks have low to moderate resistance to crown gall. Research is underway to develop hybrid walnut rootstocks with desirable vigor as well as good resistance to soilborne pathogens.